. TOLERANCE AND SOLIDARITY . • Assistance with coordinating mechanisms for Catholic churches and Evangelical churches/missions to reinforce dialogue for peace. Unanimously, these institutions and organizations (religious and youth) feel that important results have been obtained in such a short time thanks to open communication and an atmosphere of trust established among the actors. 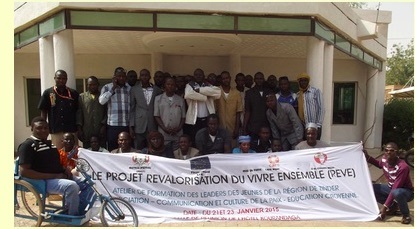 The project will conduct a process of measurement and capitalization that will, in August 2015, draw upon and communicate the results contributing to a better future for CARE and its partners alongside the state, for conflict prevention and identification of the root causes of vulnerabilities in the Sahel. In the face of armed conflicts in the Sahara-Sahel, Can a culture of peace be established? As often occurs, in the Sahara-Sahel, in the face of the terrible violence of religious extremists in Mali, there is a dialectic so that the more the violence, the more the demand for a culture of peace.